Some long-time sneaker fans mentioned that the shoe’s background ties back to their roots and childhood, which is like wearing history on their feet. A few like the fact that the Nike Air More Uptempo Supreme takes on its predecessor’s unique silhouette. The shoe provides adequate comfort thanks to its Ortholite infused insoles. Its bold design was viewed as stylish by some fashion savvy sneakerheads. A small number of purchasers think the shoe is worth its price because it is very detailed and one-of-a-kind. The Nike Air More Uptempo Supreme is available in 3 colorways. The involvement of the streetwear giant Supreme and its limited stocks makes it a hot commodity in the eyes of sneaker enthusiasts. Some say if you own one of this then you‘ve got bragging rights. A number of purchasers said the shoe runs a bit big. Some buyers disclosed that the reflective 3M borders of the letters were defective. Another video reviewer said the Nike Air More Uptempo Supreme’s bold style is not for everyone. The Nike Air More Uptempo Supreme retains the original silhouette hence it packs with it the rich background of its predecessor. Moreover, this shoe’s value just went up a lot higher due to Supreme’s involvement. The shoe is also clothed with stylish details that fashion-forward fans could appreciate. If all of these reasons resonate with you then it could be worth the buy. Just keep in mind that the comfort of this shoe is what you’d normally expect from a normal Nike retro shoe. Originally released in 1996 by Nike, the Air More Uptempo was designed by Wilson Smith. According to Smith, his inspiration for the design came from the world of graffiti and pop art. This inspiration was very evident through the bold “AIR” written across the shoe’s upper. Apart from it being known as one of the boldest basketball shoes ever, the shoe’s rise to fame was due to a popular basketball player named Scottie Pippen. Its abundant cushioning and lockdown feature made it the weapon of choice for Pippen. Ever since Uptempo has been a classic in the eyes of sneakerheads and basketball fans alike. In 2005, Nike re-released the shoe and made Uptempo fans ecstatic. It has been re-interpreted in different color combinations and materials. Fast forward to 2017, Nike teamed up with streetwear’s biggest brand, Supreme. Supreme is a skateboarding company that is known for ultra-limited releases, which in turn makes their products deemed more valuable. Nike and Supreme released the Nike Air More Uptempo Supreme exclusively online in limited numbers. The original “AIR” was replaced by “SUPREME” and made hypebeasts and sneakerheads obsessed. As expected, the shoe sold out in an instant and some are even re-selling it at unbelievable prices. The Nike Air More Uptempo Supreme boasts of a bold and chunky silhouette as it takes after retro basketball shoes. The eye-catching “SUPREME” wrapped across the shoe could add an old-school hip-hop look to your outfit. Its unique attributes could add a touch of character to your casual ensemble. Pair it with shorts or pants for what could be an ultimate casual cool look. 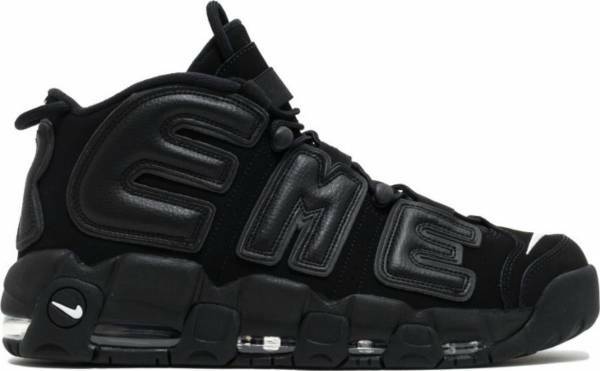 The Nike Air More Uptempo Supreme is available in men’s sizes from 6 to 14. Although it generally fits true to size, some have reported it could run a bit big. The Nike Air More Uptempo Supreme was released in 3 colorways with different materials for its upper. The tonal black’s upper is made of suede with leather overlays, while the red colorways’ upper is crafted from nubuck and leather, and lastly the gold colorway’s upper is made from an all leather material. The brand’s name “SUPREME” is placed across its upper with reflective 3M borders lining the letters. Perforation detailing is seen throughout the upper while the tongue is made from a mesh material. It features a lace-up closure with elastic bands for a secure fit. Pull-tabs are placed on both tongue and heel for aid in wearing the shoe. Nike’s Swoosh logo can be seen on the following parts: toebox, medial and lateral sides of the shoe’s upper, on the tongue, at the heel, on the midsole and, finally, on the outsole. It features the traditional Air More Uptempo sole with 4 transparent cut-away at the sides and 1 at the back. The Nike Air More Uptempo Supreme was debuted by professional basketball player Derrick Jones Jr. in 2017’s NBA All-Star Dunk Contest. The shoe is also known as Nike Suptempo. This release is considered a heavyweight collab that is highly anticipated. The red colorway is custom-made by Supreme while the black colorway is said to be a nod to the Uptempo OG’s signature colorway. The words “WORLD FAMOUS” are placed on the laces’ tips. The box comes with an extra pair of white laces and Supreme stickers.